● To exhibit research, creation and innovation in teaching and learning by higher learning institutions and polytechnic colleges. ● To share expertise and commercial, creative and innovative ideas. ● To cultivate interests and encourage academics/instructors, and students to develop teaching materials in line with current technological developments. ● Gold, silver and bronze medals. ● Certificate of participation and award. ● Research Grants (amount to be determined). ● Participants are allowed to submit more than one entry. However, there will be a fee charged for each entry. ● Each entry must submit a completed entry form with an abstract via the Registration link. ● The abstract should be approximately 200 to 250 words. If you are a novice researcher or presenting at a conference for the first time, do carry out an Internet search on “How to write a conference abstracts” and you will find numerous helpful websites. ● Product evaluation or product innovations will be made by experienced judges, selected by the organisers. ● Participants are to exhibit and demonstrate their innovations in front of a panel of judges during the judging session. ● The time allocation for the presentation and question and answer is 10 minutes. 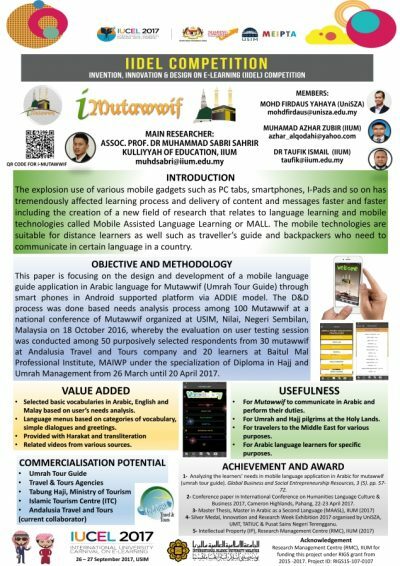 ● presentation and content of the poster. ● The jury’s decision is final. Any appeals will not be entertained.